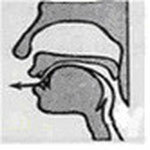 Lesson 4 Tongue-surface Sounds: j, q and x - jjeasychinese. 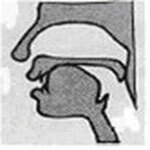 When they are pronounced, the front tongue surface should approach the front hard palate. The tongue tip should slightly touches the lower teeth. The tongue raises and touches the hard palate. The breath squeezes out. Similar to the “j” in jeep. Similar to the “ch” in cheap. Similar to the “sh” in sheep. But lips are spread on both sides.